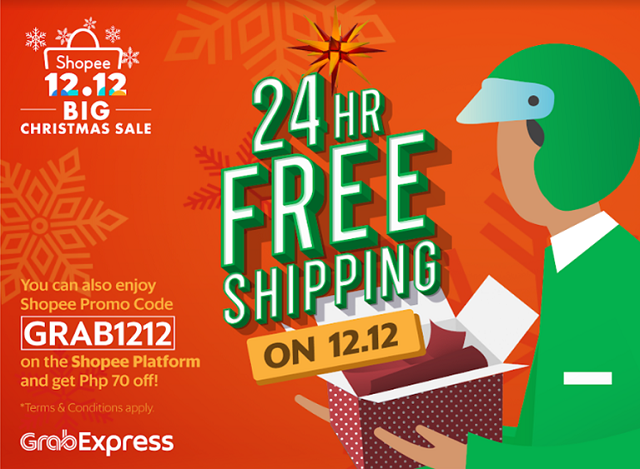 Get your Shopee 12.12 purchase on the same day with GrabExpress. Grab partners with Shopee Philippines this 12.12 Big Christmas Sale. This gives consumers more chances to enjoy discounts and sale items in as fast as same-day-delivery with GrabExpress. Buyers will be able to enjoy free same-day-delivery for a minimum spend of Php 199 courtesy of GrabExpress. On top of that, the country's leading "Online-to-Offline" platform is also treating shoppers with Php 70 discount upon using a GRAB1212 promo code when checking out their items. A minimum purchase of Php 350 is needed to avail the discount. “One of the best feelings on earth is being home and spending time with our family and friends. As an everyday app, we are mindful that the holiday traffic and madness can easily take our time away from our loved ones,” said Cindy Toh, Grab Philippines’ Country Marketing Head. In an email, Toh also added that GRAB partnered with Shopee to extend convenience of same-day-delivery while shopping online, and delight their customers with treats and discounts. The Shopee 12.12. Big Christmas Sale is the final wave of the Shopee 11.11 - 12.12 Big Christmas Sale offering. You can get deal of up to 99% off from leading brands including P&G, Maybelline, Vivo, SM Store, Silverworks, Unilever, Lactum, and Platinum Karaoke. Shopee has also partnered with Viber, Mini Stop, and Smart to give users exclusive promotions this holiday season. The Shopee 12.12 Big Christmas Sale will also feature daily free shipping promotions, flash sales as low as Php 12, and over 12 million Shopee coins to be given away from the iconic Shopee Shake game. You can check out the deals by pulling up your Shopee app. Enjoy shopping with GrabExpress and Shopee!